I started out to find a villa —an estate— I hadn't heard of before and found a religious order and a scandal of the kind I wish I would stop hearing about. There is in Naples an area still called la Duchesca, named after the Villa Duchesca (The Villa of the Duchess). It was one of those glorious pieces of royal property with gardens, fountains, trees and footpaths. It was a project of the Aragonese rulers of Naples in the 1490s, similar to another one, Poggioreale, built more or less at the same time; both underwent identical trips to oblivion as the years passed. 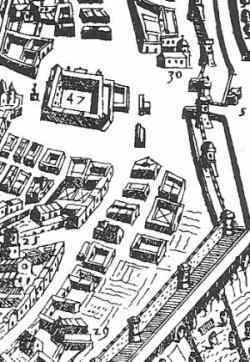 The Villa Duchesca was in the lower right-hand quadrant of this map from 1566, that is, between the Capuano Castle (#47 on the map), which still exists, and the western end of modern Piazza Garibaldi (just off the extreme lower right-hand corner of this map). By the date of this map, however, only a few buildings and a bit of empty space just inside the city walls remained of the old villa. We know from sources*1 that the villa was planned to be an adjunct of the Capuano Castle, itself—a place for the royals to stroll. It was built quickly in the area just within the newly expanded city walls (the section below #5 on the map) and deteriorated just as quickly as the Aragonese dynasty came to an end. The French invaded Naples in 1500, enjoyed the villa, praised it and just as quickly sacked it when they were forced to leave as the new Spanish empire moved in. (If that confuses you, it confused them, too! See the above link to the "Aragonese Dynasty" for some clarification.) During the chaos of the violent change of dynasties, further assaults on the villa came from street mobs and those interested in salvaging building materials for their own projects. Such maps as the one above from a mere 50 years later, after the great wave of Spanish expansion of the city, show that the Spanish had largely succeeded in their effort to rid the city within the walls of frivolous things such as gardens as they shored up the walled defences of the city. The buildings on the original premises of the Villa Duchesca were what was left of original structures on the estate or later add-ons by the Spanish. It is all gone now, fallen victim to a number of things: Spanish neglect of—and scavenging of—earlier structures, more of the same by later Bourbon rulers in the 1700s, the later urban renewal of the Risanamento in the late 1800s, and, finally, the air-raids of WWII. All that is left of the Duchesca are some names such as a street, via Duchesca, and the fact that the entire quarter is still called "la Duchesca". It is now a squalid hive of black-marketeers and pickpockets and you'd better stay out of it if you know what's good for you. A parallel street (alley, really) to via Duchesca is via Giuseppe Calasanzio, and so the story continues. Giuseppe Calasanzio (José Calasanz in the original Spanish and Calasanctius in the Latin version) (1556-1648) was the founder of the Catholic education order known as the "Piarists" (from Ordo Clericorum Regularium pauperum Matris Dei Scholarum Piarum, or Order of Poor Clerics Regular of the Mother of God of the Pious Schools). They are generally called scolopi in Italian (from scuole pie—pious schools). It was an order dedicated to free education for poor children and actually served as a model for later Catholic societies and even secular state-run educational systems. Calasanctius was born in Spain and moved to Rome in 1592 to set up his order and engage other clerics who wanted to work with him towards the goal of free education for the poor. He opened his school in Rome in 1597. In 1626 he opened his first school in Naples; it was on the premises of the old Villa Duchesca, which is why there is still a street there that bears his name. Other schools followed quickly, both in Naples and elsewhere. All in all, between 1626 and 1752, 21 Pious Schools schools were opened in the Kingdom of Naples. That is the good news. The bad news is that the origins of the order were shrouded in a pedophilia scandal that apparently began in Naples. *3 Calasanctius' problems started when he learned that the headmaster of the original school in Naples, Father Stefano Cherubini, was sexually abusing children. Cherubini was from a family of papal lawyers whom Calasanctius was more or less powerless to fight. Knowing that his schools were done if allegations were made public, Calasanctius tried to "kick Cherubini upstairs" to an administrative position physically away from the children. That did not work since similar rumors started to circulate about those who replaced Cherubini in Naples. Cherubini, himself, moved up in the hierarchy of the order and in 1643 replaced the aging Calasanctius as the head of the entire order. At that point, Calasanctius went public with Cherubini's history of child molestation. Calasanctius was then threatened both legally and physically by Cherubini. The entire affair so embroiled the order of the Pious Schools in church politics that Pope Innocent X disbanded the order in 1646 under the guise that there was internal dissent within the order. Shuffling pedophiles from one place to another instead of dealing with the problem of this most evil of vices has a modern ring to it, unfortunately. With the unification of Italy, the Vatican States disappeared and the tiny new Vatican state refused to recognize the modern state of Italy; thus, the possibility of schools run by Catholic religious orders in Italy could not be dealt with until that situation changed. It did so in the 1920s when the Gentile Reform (1923) encouraged Catholic education and when the Concordato (The Lateran Treaty of 1929) normalized relations between the Italian State and the Vatican. The Piarist order and the Pious Schools reemerged. The Pious School in Naples opened again in Naples in 1954 and is currently housed in a marvelous and large complex in the Fuorigrotta section of town. The school covers early elementary grades through the last year of high school as a "scientific lyceum." The sports facilities and modern science and computer labs are impressive, and the school, itself, is adjacent to the modern church of San Giuseppe Calasanzio.